Typically, the mainstream U.S. media responds to a major leak of U.S. intelligence secrets as a whodunit search for the leaker rather than focus on the troubling disclosures, as Jesselyn Radack notes after the “Vault 7” release. It is the leakiest of times in the Executive Branch. Last week, Wikileaks published a massive and, by all accounts genuine, trove of documents revealing that the CIA has been stockpiling, and lost control of, hacking tools it uses against targets. Particularly noteworthy were the revelations that the CIA developed a tool to hack Samsung TVs and turn them into recording devices and that the CIA worked to infiltrate both Apple and Google smart phone operating systems since it could not break encryption. No one in government has challenged the authenticity of the documents disclosed. The FBI has already begun hunting down the source as part of a criminal leak investigation. Historically, the criminal justice system has been a particularly inept judge of who is a whistleblower. Moreover, it has allowed the use of the pernicious Espionage Act — an arcane law meant to go after spies — to go after whistleblowers who reveal information the public interest. My client, former NSA senior official Thomas Drake, was prosecuted under the Espionage Act, only to later be widely recognized as a whistleblower. There is no public interest defense to Espionage Act charges, and courts have ruled that a whistleblower’s motive, however salutary, is irrelevant to determining guilt. The Intelligence Community is an equally bad judge of who is a whistleblower, and has a vested interest in giving no positive reinforcement to those who air its dirty laundry. The Intelligence Community reflexively claims that anyone who makes public secret information is not a whistleblower. Former NSA and CIA Director General Michael V. Hayden speculated that the recent leaks are to be blamed on young millennials harboring some disrespect for the venerable intelligence agencies responsible for mass surveillance and torture. Not only is his speculation speculative, but it’s proven wrong by the fact that whistleblowers who go to the press span the generational spectrum from Pentagon Papers whistleblower Daniel Ellsberg to mid-career and senior level public servants like CIA torture whistleblower John Kiriakou and NSA whistleblower Thomas Drake to early-career millennials like Army whistleblower Chelsea Manning and NSA whistleblower Edward Snowden. The lawbreaker does not get to decide who is a whistleblower. Not all leaks of information are whistleblowing, and the word “whistleblower” is a loaded term, so whether or not the Vault 7 source conceives of him or herself as a whistleblower is not a particularly pertinent inquiry. The label “whistleblower” does not convey some mythical power or goodness, or some “moral narcissism,” a term used to describe me when I blew the whistle. 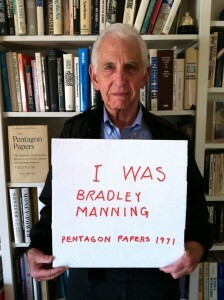 Pentagon Papers whistleblower Daniel Ellsberg, standing up for Pvt. Bradley (now Chelsea) Manning. Rather, whether an action is whistleblowing depends on whether or not the information disclosed is in the public interest and reveals fraud, waste, abuse, illegality or dangers to public health and safety. Even if some of the information revealed does not qualify, it should be remembered that whistleblowers are often faulted with being over- or under-inclusive with their disclosures. Again, it is the quality of the information, not the quantity, nor the character of the source. Already, the information in the Vault 7 documents revealed that the Intelligence Community has misled the American people. In the wake of Snowden’s revelations, the Intelligence Community committed to avoid the stockpiling of technological vulnerabilities, publicly claiming that its bias was toward “disclosing them” so as to better protect everyone’s privacy. However, the Vault 7 documents reveal just the opposite: not only has the CIA been stockpiling exploits, it has been aggressively working to undermine our Internet security. Even assuming the CIA is using its hacking tools against the right targets, a pause-worthy presumption given the agency’s checkered history, the CIA has empowered the rest of the hacker world and foreign adversaries by hoarding vulnerabilities, and thereby undermined the privacy rights of all Americans and millions of innocent people around the world. Democracy depends on an informed citizenry, and journalistic sources — whether they call themselves whistleblowers or not — are a critical component when the government uses national security as justification to keep so much of its activities hidden from public view. As we learn more about the Vault 7 source and the disclosures, our focus should be on the substance of the disclosures. Historically, the government’s reflexive instinct is to shoot the messenger, pathologize the whistleblower, and drill down on his or her motives, while the transparency community holds its breath that he or she will turn out to be pure as the driven snow. But that’s all deflection from plumbing the much more difficult questions, which are: Should the CIA be allowed to conduct these activities, and should it be doing so in secret without any public oversight? These are questions we would not even be asking without the Vault 7 source. Isn’t it interesting that MSM is not talking about Vault 7, must be they have their marching orders? A repeated pattern in US history: US Spooks – that is CIA, NSA, FBI, etc. – willfully, by secret policy, ignore most all of the laws that are supposed to govern their behavior when they can get away with it, in secret. If they get caught, and IF the media happens to make a big stink about an issue, only then will Congress hold meetings. In these meethings, only a few relevant things get precisely said in public. The great “protectors” of national security – CIA/NSA/FBI/DOD – will claim that defense of the nation requires that precise statements & perjuries on these issues take place in closed/exec session where few, if any, fact checkers can discover and tag the lies. After that charade is completed, there is a public PR session where the agencies make some sad faces, and promise (fingers crossed behind their back) not to do that anymore, in their passionate zeal to defend this great nation….Then it’s back to ignoring the laws, and business as usual. Investigative reporters are great resources when they can uncover or simply tell a story that someone else uncovered. For historical events, journalists are doing a lot with FOIA, sometimes by accident – c.f. Bruce Schneier’s piece on how James Bamford uncovered Operation Northwoods while researching the NSA with FOIAs: http://www.salon.com/2001/04/25/nsa_3/ However, in modern times, reporters seem to be falling behind regarding their ability to uncover current day Security State crime. For example, the public first learned about the Stingray surveillance program – being widely used in the domestic US by FBI and local police – from the research of accused felon Daniel Rigmaiden, working from prison, and then having the guts to walk away from a plea deal that would have required his silence about Stingray. In order to do better, it’s necessary for the public to understand the need to be skeptical by default about US Spook behavior, and necessary for the public to demand the same skepticism from the public’s supposed alarm system – ii.e. the press and the politicians – who have become > 95% aligned with CIA/NSA/FBI in the present era. The public needs to wake up and realize that their implicit premise of having watchdogs working for them and looking out for their interests has failed. “The System” doesn’t work that way, and, in truth, it never has. 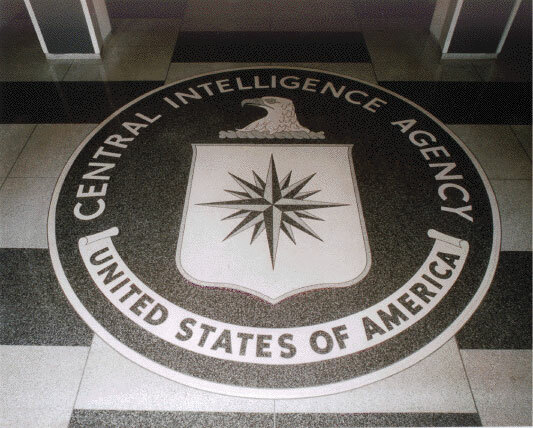 What is the true function of the CIA & NSA? Their own preservation and self-perpetuation, and that’s why their members are so testosterstoned. Should the US permit and fund their continued existence? Only if it wishes to continue to trade with the world — and now even its own citizens — in routine bad faith. ‘By now is the world with such spookiness so full, no one knows how best he might escape it’. In my 69th year, my heart sure goes out for all the millennials. Thanks so much Jesselyn for all that you and your friends have been up to these last few years — it’s sure mattered a great deal to me, and to so very many of the millennials, no doubt. The Intelligence Community reflexively claims that anyone who makes public secret information is not a whistleblower. Former NSA and CIA Director General Michael V. Hayden speculated that the recent leaks are to be blamed on young millennials harboring some disrespect for the venerable intelligence agencies responsible for mass surveillance and torture. Therein lies hope that some decency and integrity will survive the current trend towards authoritarianism and fascism. Has Michael Hayden ever given thought as to why young millennials and some of their elders not only have disrespect but also contempt for the venerable intelligence agencies responsible for mass surveillance and torture? My client, former NSA senior official Thomas Drake, was prosecuted under the Espionage Act. Prosecutions of people under the Espionage Act are good sources for finding heroes in American history – beginning with Eugene Debs. Alternatively, the prosecutions are also good sources for discovering people who have defiled the American justice (?) system. Americans more generally, as for example voters, have been thinking more independently. It would appear that America’s surveillance state has adapted quite well to the changes in technology required to spy on all of us. Speaking truth to power has been misinterpreted as disobedience before, even by fathers who portend love for their own flesh and blood. Lear: Let it be so! thy truth then be thy dower! Hold thee from this for ever. Later, after Lear has lost all, he regrets his deed. If only the savages who inhabit the bowels of power could be so amenable to feelings of regret and evolve into empathetic human beings!